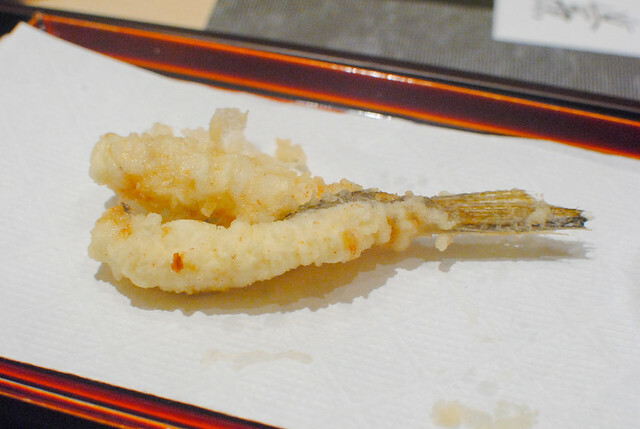 Tempura is easy to find in America, and it’s something I really enjoyed eating as a kid (especially the shrimp). 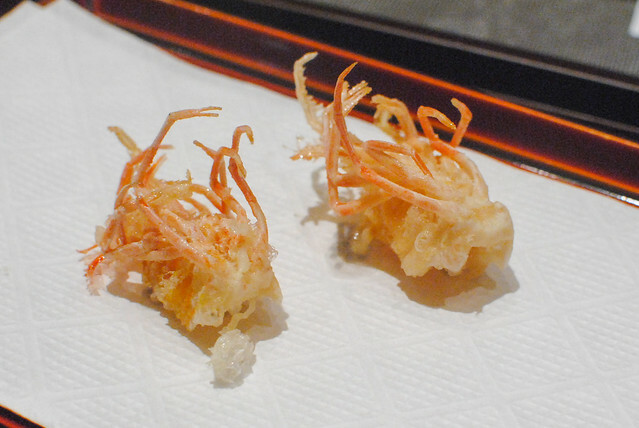 In Japan, tempura is taken to another level, with restaurants solely focused on the style. 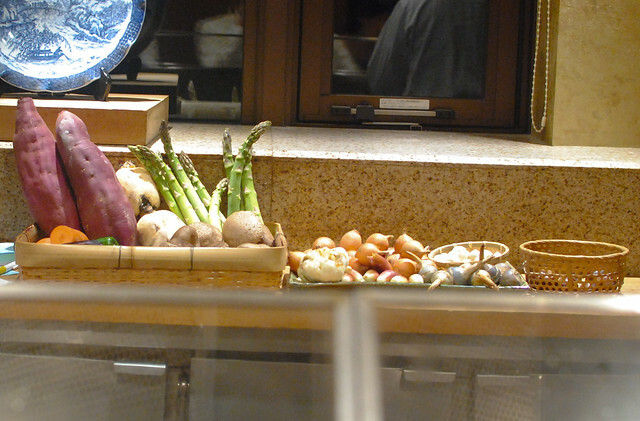 Diners sit around a bar while a chef prepares seasonal vegetables and fish right in front of you. 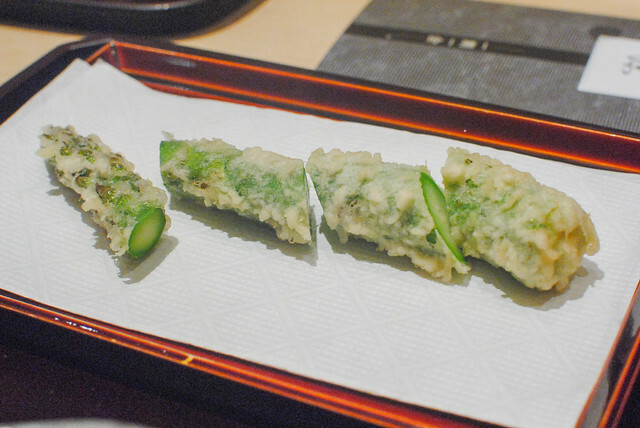 It’s similar to a sushi or kaiseki meal in that aspect, and the prices can be just as high. As far as I know, we don’t have anything quite like this in America. 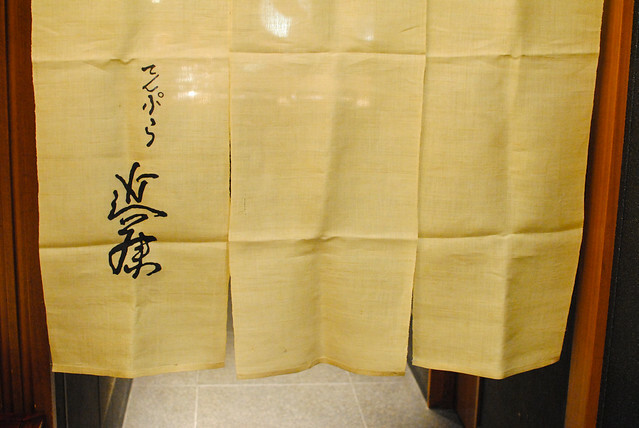 Tempura Kondo is a Michelin two-star restaurant in Ginza, helmed by Fumio Kondo. 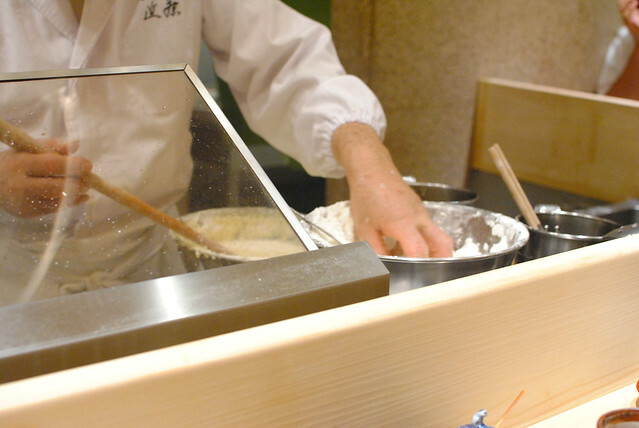 It’s one of the most notable tempura restaurants in Tokyo, partially because Kondo-san is a bit of a chef celebrity, often seen on TV. 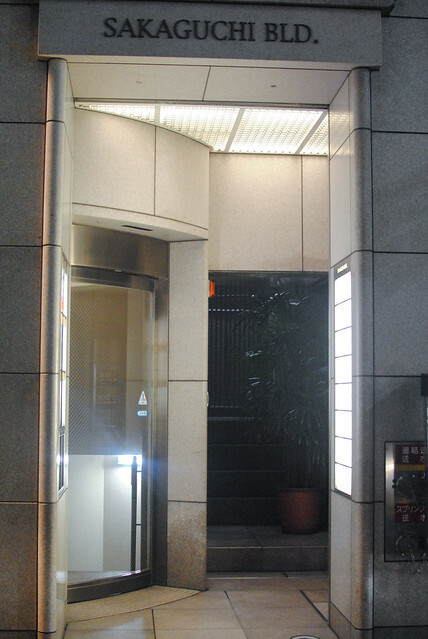 Three fixed menus were available of differing lengths: ¥10,500, ¥12,600, and ¥17,850. 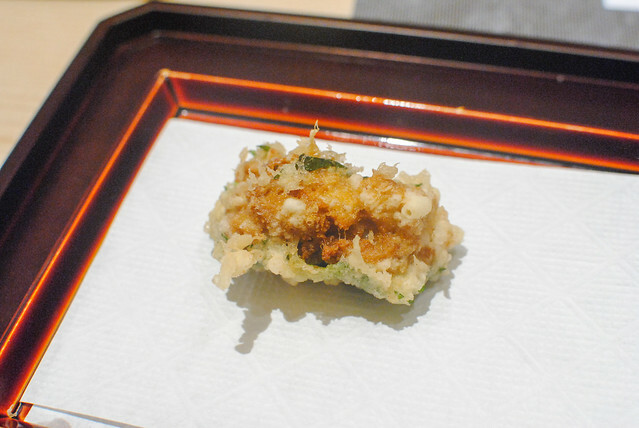 I went with the middle choice, supplementing it with two a la carte tempura dishes: uni with shiso and sweet potato. Dining alone, I was lucky enough to be seated in the middle, right in front of Kondo-san himself! 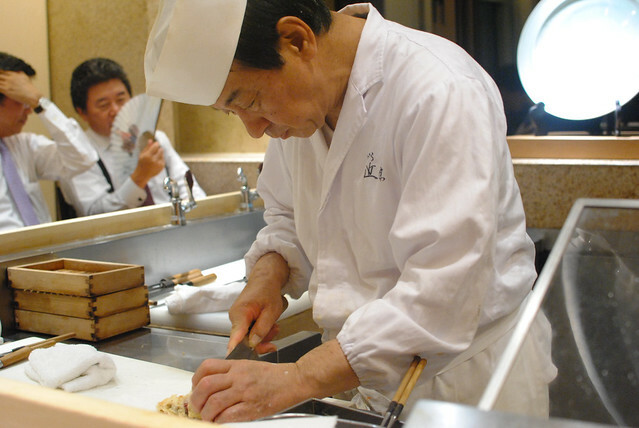 Preparing tempura appears fairly simple in concept, but the precision in execution was definitely on display with such a view of the action. I started with whole baby shrimp marinated in soy. Served raw, they were sweet with a little bit of a delightful crunch. 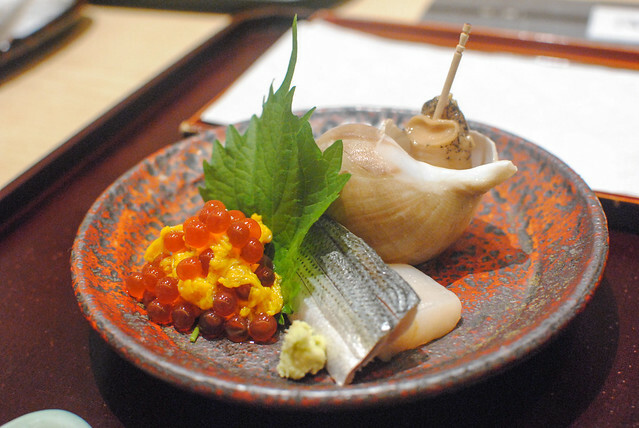 A small sashimi plate was next: I enjoyed the scallop and sea snail most. 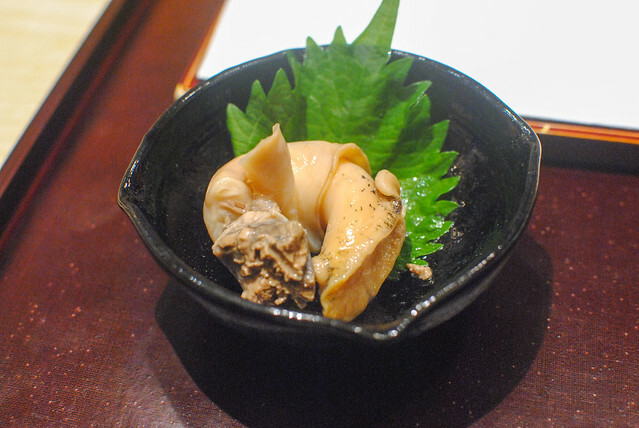 The sea snail, pulled out of its shell, yielded a very sweet, tasty meat. Creamy tofu and a duo of creamy starches from the nuts and potato combined for a rather savory, earthy mix. 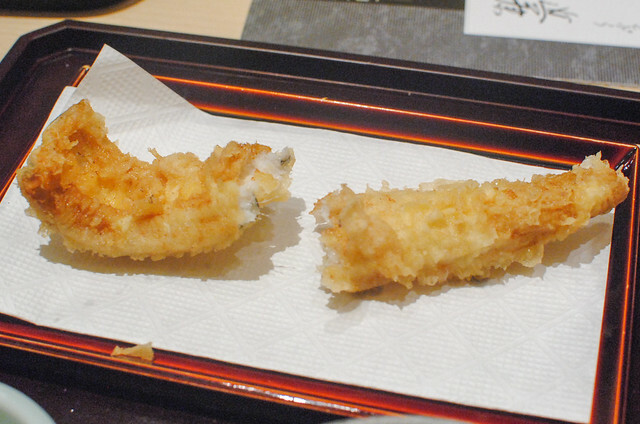 With the first few dishes done, we moved on to tempura service. Light and crunchy, these were quite nice. 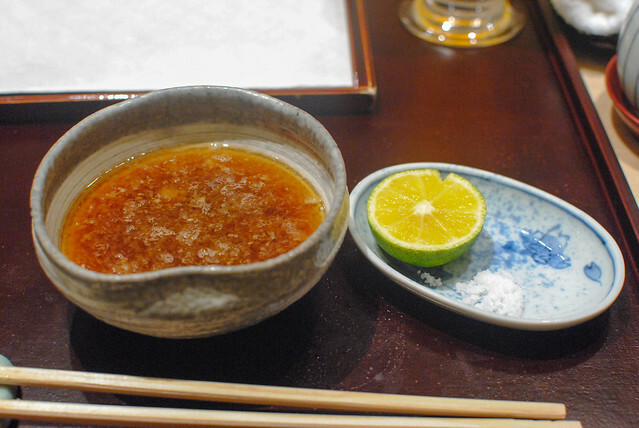 Next up was a pair of shrimp – one was eaten with a squirt of fresh sudachi juice while the other with the more traditional dashi-based dipping sauce. 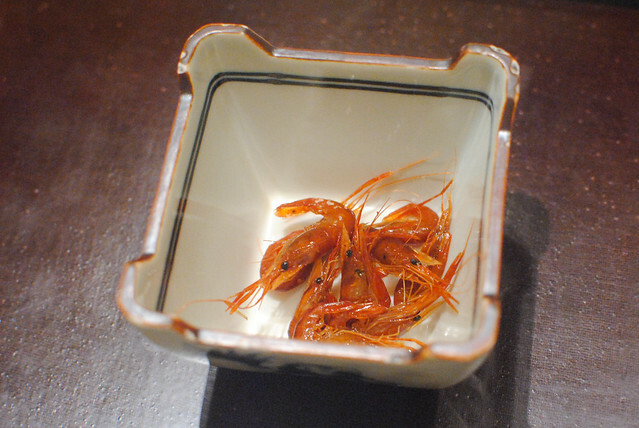 I liked them both, complementing the hot, sweet flesh of the shrimp. The batter was light, crisp, and not at all oily. Huge spears of asparagus from Australia were fried then cut. These were quite flavorful, almost juicy, with a nice crunch. 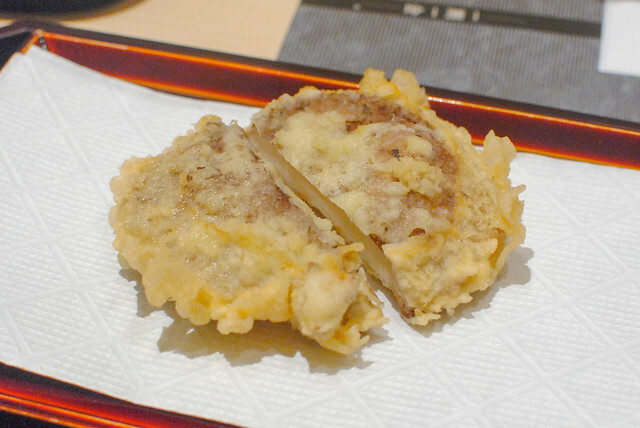 The tender shiitake mushroom was next with its characteristic woody, earthy flavor. This flat white fish was cooked well, moist with a pretty light flavor. This tasted kind of like a roasted chestnut on the inside, with a hearty creamy texture. 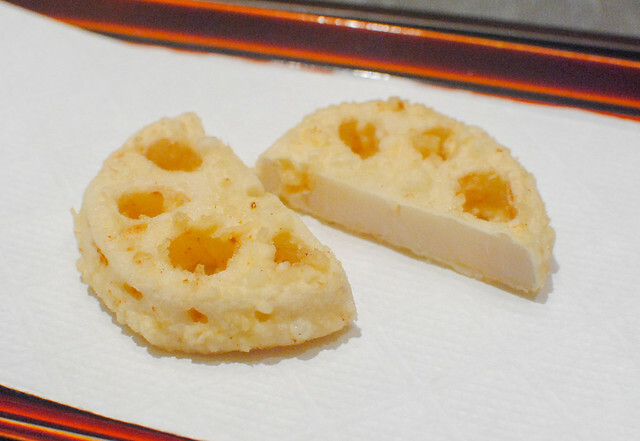 I found this lotus root to be a highlight. 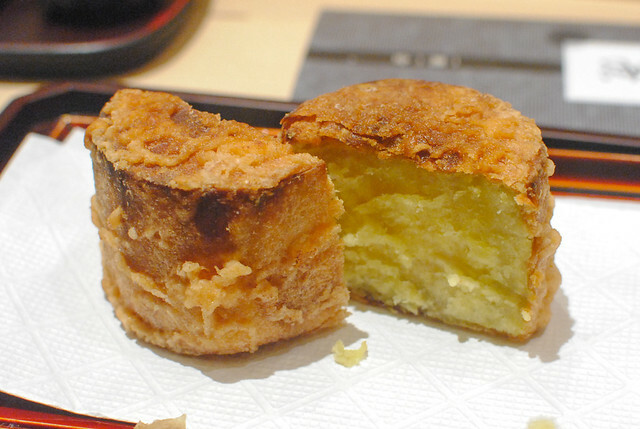 I thought it was perfectly cooked, with a crispy texture, and a sort of earthy sweetness. 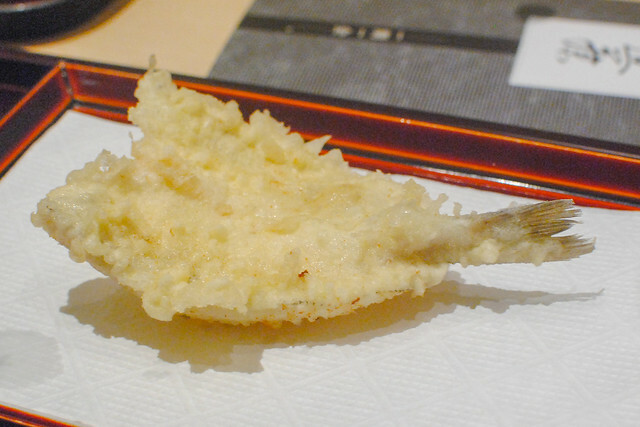 This white fish had a stronger flavor than the kisu, along with a denser flesh. Still tasty though. Soft and juicy, almost mushy on the inside. Good flavor. This was an extra order off the set menu, and a bit of the letdown. 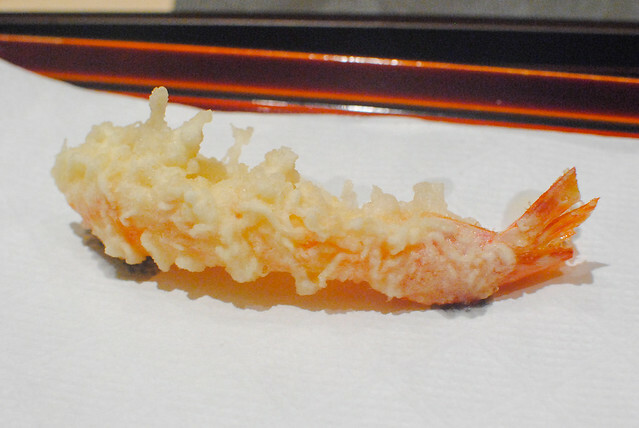 I thought it was cooked well with a creamy interior, but the clean flavor of the uni was somehow lost. Instead, it tasted kind of murky and just off. Sweet and tender, this one tasted about as expected. 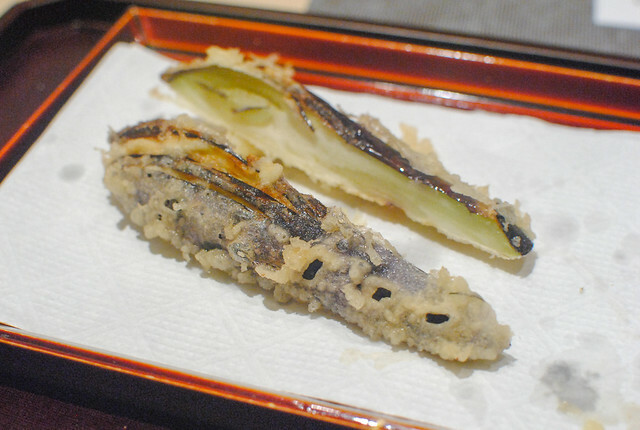 Rich in flavor and moist, I enjoyed this piece of sea eel. This is supposedly one of the specialties here, and another off-menu item. Seriously, this thing was huge…at this point in the meal, I could barely finish it. I don’t normally love sweet potatoes and this one didn’t particularly win me over either. The interior was sweet with a roasted flavor…almost creamy. Cooked well, but just not for me. 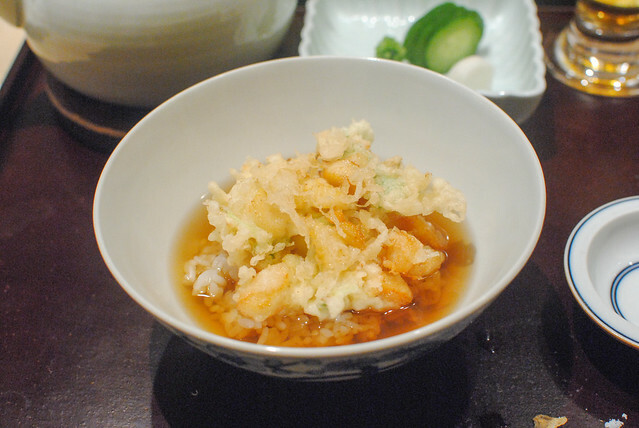 The next course (and final savory) was kakiage served in three different ways: tendon (atop rice with sauce), ten-cha (atop rice with tea) and separately with rice. I went with this choice since it seemed the most unique to me. 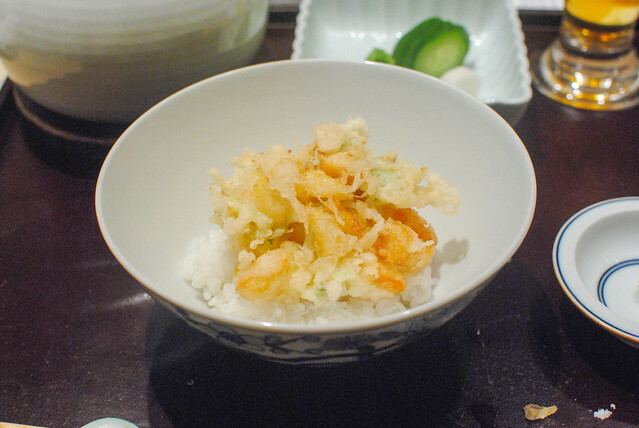 The rice had a nice chew to it that held up in the roasted tea; parts of crispy and soggy kakiage made an interesting mix of textures, packed with small chunks of seafood. 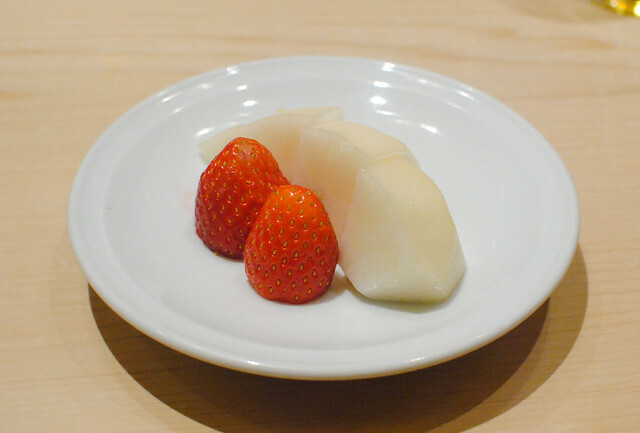 The last course of the evening was a simple plate of fruit. Very sweet, these were quite delicious. 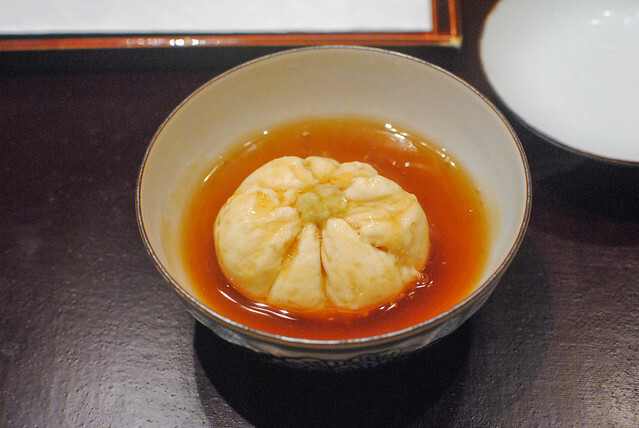 I enjoyed my meal at Kondo and left completely stuffed; it was truly a unique type of meal. Having said that, I was far from being blown away; maybe my expectations were too high, but I found it slightly disappointing. Everything was pretty good but nothing really was great; overall, for 200 bucks I was looking for something a bit more. $200?!? 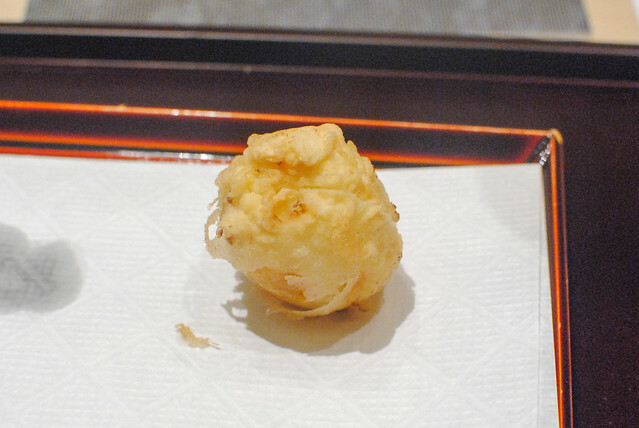 Damn… I like the look and sound of an all-tempura supper, but would seek it out elsewhere. That’s too pretty a penny to pay. 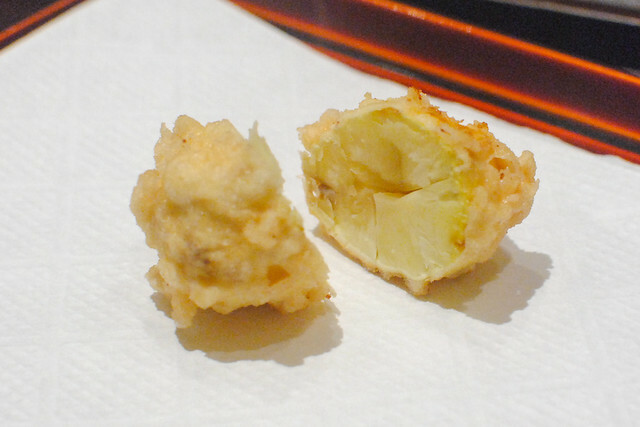 What used to be the New Otani Hotel in Los Angeles had a tempura bar that featured chefs from Japan creating expertly made tempura meals. My mother used to take me there for special occasions, and the chef behind the counter used to be incredibly nice about responding to my rudimentary Japanese (mostly versions of, “It’s delicious! Thank you!”). Wherever the chefs are now who provided those beautiful experiences, I hope they realize how happy they made my mother and me. Wow that sounds awesome Elisa – I believe it was Senbazuru? I’m sad I missed out on that!